Yaser Sheikh is an Associate Professor at the Robotics Institute, Carnegie Mellon University, with appointments in the Mechanical Engineering Department. 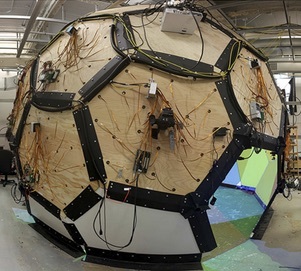 He also leads Oculus Research Pittsburgh, a Facebook lab focused on Social VR. 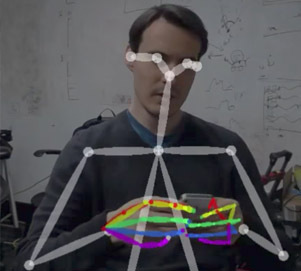 His research is focused on machine perception and rendering of social behavior, spanning sub-disciplines in computer vision, computer graphics, and machine learning. He has won Popular Science’s Best of What’s New Award, the Honda Initiation Award (2010), best paper awards at WACV (2012), SAP (2012), SCA (2010), and ICCV THEMIS (2009), and placed first in the MSCOCO Keypoint Challenge (2016); he received the Hillman Fellowship for Excellence in Computer Science Research (2004). 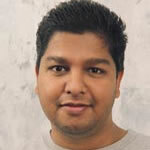 Yaser has served as a senior committee member at leading conferences in computer vision, computer graphics, and robotics including SIGGRAPH (2013, 2014), CVPR (2014, 2015), ICRA (2014, 2016), ICCP (2011), and served as an Associate Editor of CVIU. His research is sponsored by various government research offices, including NSF and DARPA, and several industrial partners including the Intel Corporation, the Walt Disney Company, Nissan, Honda, Toyota, and the Samsung Group. His research has been featured by various media outlets including The New York Times, The Verge, Popular Science, BBC, MSNBC, New Scientist, slashdot, and WIRED. He received his PhD in 2006 from the University of Central Florida advised by Prof. Mubarak Shah, and completed a postdoctoral fellowship in 2008 at Carnegie Mellon University under the mentorship of Takeo Kanade. He received his BS degree from the Ghulam Ishaq Institute of Engineering Science and Technology in 2001. ACM Transactions on Graphics (TOG), 2018. IEEE Conference on Computer Vision and Pattern Recognition (CVPR), 2018. IEEE Transactions on Pattern Analysis and Machine Intelligence (TPAMI), 2017. IEEE International Conference on Computer Vision (ICCV), October 2017. Transactions on Pattern Analysis and Machine Intelligence (TPAMI), 2016. IEEE CGA Special Issue on Quality Assessment and Perception in Computer Graphics (CGA), 2016.
International Conference on Robotics and Automation (ICRA), 2016. ACM Transactions on Graphics (TOG), 2015.
International Conference on Computer Vision (ICCV) 2015. IEEE International Conference on Computer Vision and Pattern Recognition (CVPR), 2014. British Machine Vision Conference (BMVC), 2014. IEEE Winter Conference on Application of Computer Vision (WACV), 2014. IEEE Workshop on Computational Cameras and Displays (CCD), 2014. IEEE International Conference on Computer Vision and Pattern Recognition (CVPR), 2013. IEEE Computer Vision and Pattern Recognition Workshop (CVPRW), 2013. ACM Transactions on Graphics (TOG), 2012. ACM Symposium on Applied Perception (SAP), 2012. Best paper honorable mention! IEEE Workshop on the Applications of Computer Vision (WACV), 2012. Best paper award! IEEE Transactions on Pattern Analysis and Machine Intelligence (TPAMI), 2011. IEEE International Conference on Computer Vision and Pattern Recognition (CVPR), 2011. IEEE International Conference on Computer Vision (ICCV), 2011. 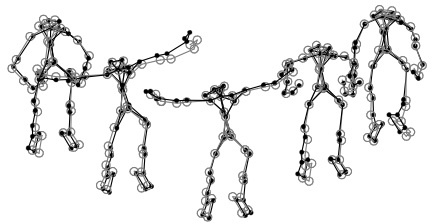 Symposium on Computer Animation (SCA), 2011. Symposium on Computer Animation (SCA), 2010. Best paper award! International Journal of Computer Vision (IJCV), 2009. Workshop on Tracking Humans for the Evaluation of their Motion in Image Sequences (THEMIS), 2009. Best paper award! International Symposium of Mixed and Augmented Reality (ISMAR), 2009. Symposium on Computer Animation (SCA), 2009. IEEE Transactions on Pattern Analysis and Machine Intelligence (TPAMI), 2008. Neural Information Processing Systems (NIPS), 2008. IEEE International Conference on Automatic Face and Gesture Recognition (FG), 2008. IEEE International Conference on Computer Vision and Pattern Recognition (CVPR), 2008. ACM International Conference on Multimedia, 2006. IEEE International Conference on Computer Vision and Pattern Recognition (CVPR), 2006. IEEE Transactions on Pattern Analysis and Machine Intelligence (TPAMI), 2005. IEEE Transactions on Circuit and System for Video Technology (TCSVT), 2005. IEEE International Conference on Computer Vision (ICCV), 2005. IEEE International Conference on Computer Vision and Pattern Recognition (CVPR), 2005. SPIE Symposium on Defense and Security, 2005. IAPR International Conference on Pattern Recognition (ICPR), 2004. American Association for Artificial Intelligence (AAAI), 2004. Asian Conference on Computer Vision (ACCV), 2004. SPIE Symposium on Defense and Security, 2004. 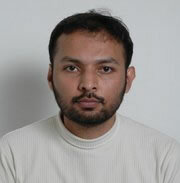 In Video Registration, Video Computing Series, 2003. Workshop on Multimedia and Document Engineering, Berlin, Germany, 2003. CMU Panoptic Studio Dataset: Multiview Dataset for 3D Social Signals Paper to Reference: ""Panoptic Studio," Joo et al., TPAMI 2017. 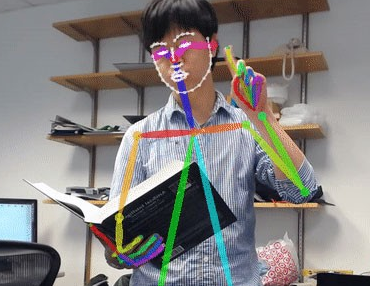 Open Pose: Realtime 2D Hand Pose Detection Paper to Reference: "Hand Keypoint Detection in Single Images using Multiview Bootstrapping," Tomas Simon, Hanbyul Joo, Iain Matthews, and Yaser Sheikh, CVPR 2017. 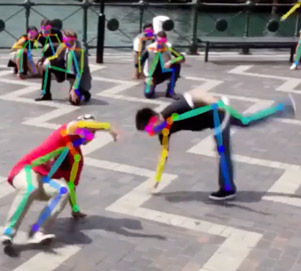 Open Pose: Realtime 2D Pose Detection for Multiple People Paper to Reference: "Realtime multi-person 2d pose estimation using part affinity fields," Zhe Cao, Tomas Simon, Shih-En Wei, Yaser Sheikh, CVPR 2017. 3D Human Pose from 2D Image Landmarks Paper to Reference: "Reconstructing 3d Human Pose from 2d Image Landmarks", Varun Ramakrishna, Takeo Kanade, and Yaser Sheikh, European Conference on Computer Vision, 2012. Bilinear Spatiotemoporal Basis Models (MATLAB toolbox) Paper to Reference: "Bilinear Spatiotemporal Basis Models", Ijaz Akhter, Tomas Simon, Sohaib Khan, Iain Matthews, Yaser Sheikh, ACM Transactions on Computer Graphics, 2012. MATLAB code Paper to Reference: "Linearized Motion Estimation for Articulated Planes"
Paper to Reference: "Nonrigid Structure from Motion in Trajectory Space"
Yaser Ajmal Sheikh, Erum Arif Khan, Takeo Kanade. Paper to Reference: "Bayesian Modeling of Dynamic Scenes for Object Detection"
New Scientist Magazine, October 2009.